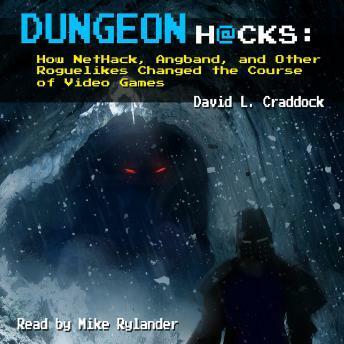 Listen to "Dungeon Hacks: How NetHack, Angband, and Other Roguelikes Changed the Course of Video Games" on your iOS and Android device. In 1980, computers were instruments of science and mathematics, military secrets and academia. Stern administrators lorded over sterile university laboratories and stressed one point to the wide-eyed students privileged enough to set foot within them: Computers were not toys. Defying authority, hackers seized control of monolithic mainframes to create a new breed of computer game: the roguelike, cryptic and tough-as-nails adventures drawn from text-based symbols instead of state-of-the-art 3D graphics. Despite their visual simplicity, roguelike games captivate thousands of players around the world. From the author of the bestselling Stay Awhile and Listen series, Dungeon Hacks introduces you to the visionaries behind some of the most popular roguelikes of all time, and shows how their creations paved the way for the blockbuster video games of todayand beyond. Although I've never played NetHacks and it's ilk, I played D&D when I was a kid and know the culture. This book was a fun listen. The book is a good review of the history of Roguelike games. A category I was unfamiliar with (even thoughI I had played one in the early nineties) The book is fairly short which is good as an introduction. It is not an exhaustive history so if you are familiar with the genre you may feel it lacking. Good reader, perfect for the material.